Having a nice place to sit outside and have a drink and conversation is very relaxing. If you have two chairs or a sofa, you may need a place to rest that drink for a few minutes if you talk with your hands like I do. A round patio side table will work fine for this need. I have several sitting areas that have several styles of side tables. I will look at four different styles in this post and you can choose what style will work best for you. 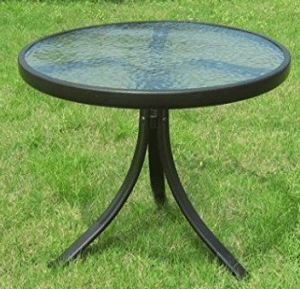 This glass top table will be a nice addition to your patio or balcony. The powder coated frame will need little work to keep looking like new. The tempered glass top will withstand almost any rough treatment. The table is 20 inches across and 17.5 inches tall. Easy assembly as you just have to lay the top upside down and place the legs in the underside of the top. The legs are held together with one screw on each leg. Only customers complaints on this table are that you have to watch the moisture build up in the legs so they do not split in the winter. Great table for the price. If you have a wicker decor outside, this side table will work. It can be ordered in five colors (White, Red, Light Brown, Green and Dark Brown). The powder coated steel frame will have a resin wicker weave on the outside. Table is 20 inches across and 20 inches tall. Easy to move as it only weighs 9 pounds. Simple assembly, attach legs to round center piece and make sure legs were in the slots in the top. Price is on the high side, the resin wicker finish should last a lifetime. If you already own any of the Azalea Ridge collection, this side table will fit right in. The reddish brown resin wicker will blend into any outdoor decor, you can also purchase in white for lighter decors. The powder coated steel frame will make it very sturdy. The top is a dark brown tempered glass with a resin wicker boarder. The table is a little taller at 24 inches and 19.75 inches across. It weighs 12.3 pounds. Minor assembly required, just attach legs to center circle and make sure they are in the proper slots in the top. About half the price of the Palm Harbor side table, just not a many color options. I have several articles on the seating designs of the Azalea Ridge collection. See the four piece sitting set here. Have some retro metal chairs in your outdoor space, this side table will fit in nicely. The all powder coated metal table has the old time look and is available in four colors (Green, White, Red and Blue) to match your current color. Has white caps for the legs. It is 20 inches across and 19.5 inches tall. The table will weigh 9 pounds. Assembly is easy as you just have to put the legs together and attach to the top. Wrench is included, it is a throw away kind do not expect much from it. This retro table will fit a lot of decors, even if you do not have retro chairs. It is very durable with the powder coated finish. I have had the two metal tables and still have a white square one with the glass top. All of these tables will be very durable in any outdoor climate. The decor factor will be the one that will determine what will work for you. 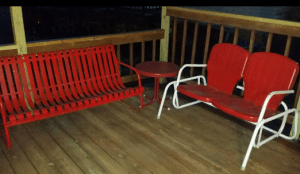 I have two tan swivel rockers on my front porch and she changes the side table out there several times a year. Having more than one style of side table will let you change how your space looks with a high price tag. 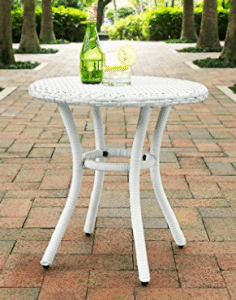 If you cannot fit a bistro table in your out door space, try one of these round patio side tables. They will work well for a drink, book or just some place to lay your mobile device down when you just want to chat. I cannot wait until warmer weather so I can sit out and watch the world go by just sipping on my favorite beverage. If you found this article interesting please share with your friends on your social network. If you have any questions, comments or would like more information on an outdoor decor item, use the forms below. These side tables will work great in a garden area. Any place you have two chairs that you will need to sit your drink down next to. 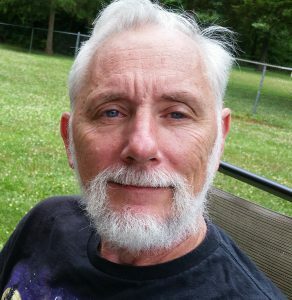 Nice informative article. I quite like the Crosley Palm Harbor Outdoor Wicker Round Side Table. How much would that cost and do you freight internationally? 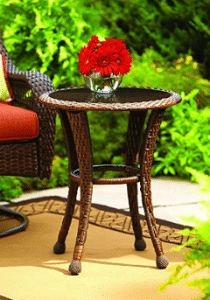 The Palm Harbor Wicker table is priced at $99 today, this price is subject to change. It is available to be shipped internationally from other vendors. I do not ship anything, I just help with ideas.